We first found hedge parsley (Torilis japonica) at Pleasant Valley Conservancy over 20 years ago. At that time it was essentially unknown in Wisconsin and Kathie collected seeds from a small patch along Pleasant Valley Road, thinking it might be a good thing to plant. 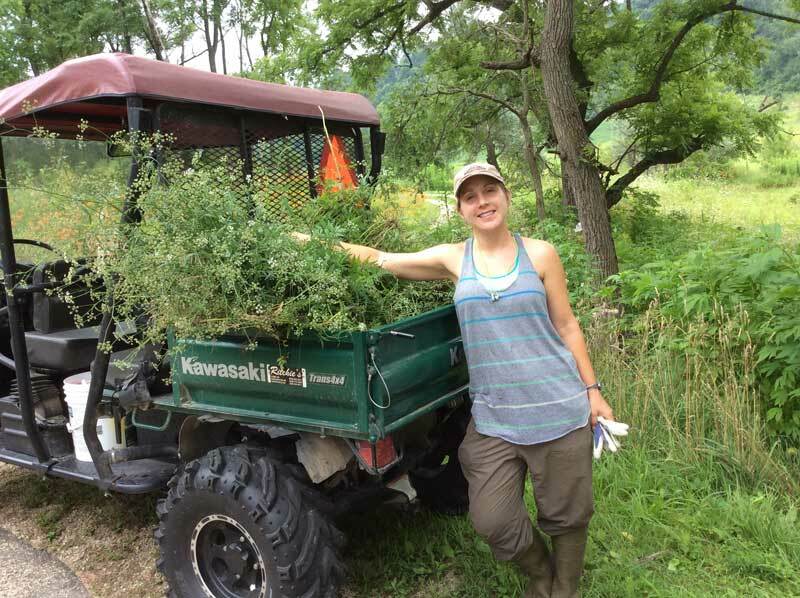 Fortunately, she first sent a sample to Kelly Kearns, the invasive plant specialist at the DNR, who informed her that it was an exotic, recently arrived from Illinois. It's a rather unassuming looking plant, not nearly as destructive looking as wild parsnip or garlic mustard. Unfortunately, in many ways it is worse than those two. Like garlic mustard, it grows best in shaded sites, such as forest edges, although we have also found it in some of our savannas. It is a biennial or winter annual, growing the first year as low, parsley-like rosettes. Like garlic mustard, the first-year plants stay green until late fall, even until snow fall. It could be sprayed at that time, but unfortunately its rather delicate leaves get covered up by tree leaves so that it is hard to find. The seeds stick like velcro and are undoubtedly transferred by rodents and deer. These seeds stick a lot worse than those of garlic mustard. Once I marked some first-year patches in late summer and then returned to them in early December, blowing the fallen leaves off with a leaf blower and then spraying with glyphosate. (This is an ideal time to spray, since all the native vegetation has senesced and hence not affected by the herbicide.) This technique worked, but unfortunately the first year plants are really hard to find among all the lush vegetation. So mostly we have relied on hand-pulling second-year flowering plants. If you get them early enough you can just lay them on the ground, but once they start setting seeds they have to be bagged (again, like garlic mustard). We have been trying carefully to pull all flowering hedge parsley plants every year, ever since we first discovered this plant, but have been unsuccessful in eradicating it. Because of its delicate structure, it is hard to see in the woods, and only shows up well when present in large flowering patches. This year hedge parsley is the worst we have ever found it. The shady North Woods has been especially bad, and our crew has been working there 2-3 days a week for the past 2-3 weeks. The results of a 15 minute "pull" by two people in a shady roadside near PVC. Since we started controlling hedge parsely 20 years ago, it has become lots more frequent on roadsides in our area. Again, it is lots more difficult to spot than garlic mustard or wild parsnip, so it can easily be missed when driving along at 50 mph. I suspect the distribution map shown below needs a serious update, as it is easy to miss this species. Lots of land managers may be unaware that they even have it. Because of its transmittal by very mobile animals like deer, it can get inoculated quite far from roads. I have seen it deep along old abandoned woods roads that are undoubtedly still used by deer. I have little hope of eradicating hedge parsley from PVC, but we are committed to doing the best we can. We usually budget two weeks in mid- to late-July, just after the sweet clover season is over. Fortunately, because of its preference for shady areas, it is less likely to show up in prairies, except along edges near woods. Sweet clover control at Black Earth Rettenmund Prairie is almost finished for the summer, and we are returning to brush control activities. Yesterday was our monthly volunteer work party, ably managed by Kathie. This year brush control work focuses on the South Unit, which was not burned. We burn each of the three units at Rettenmund two out of three years, so that each year one unit is unburned. This means that any woody vegetation in that unit is not killed and is larger and has the opportunity to leaf out, making it easier to find. This is important because we are having such good control of woody vegetation that the woodies are quite small and we need help finding them. The volunteer group walked across the whole prairie on their way to the South Unit, pulling any scattered sweet clover plants that might have been missed (very few indeed!). Our procedure for woodies is to hand clip each stem near the base, then spray the cut stem with 20% Garlon 4 in bark oil. Since each person is working alone (with clippers and spray bottle), all cut stems are sure to be treated. The cut stems are pulled out and thrown on a pile. Woody vegetation consists of gray dogwood, brambles (dewberry and black raspberry), grape, bittersweet, and the occasional small honeysuckle. Once in a while a sumac or small buckthorn is found, but not very often. 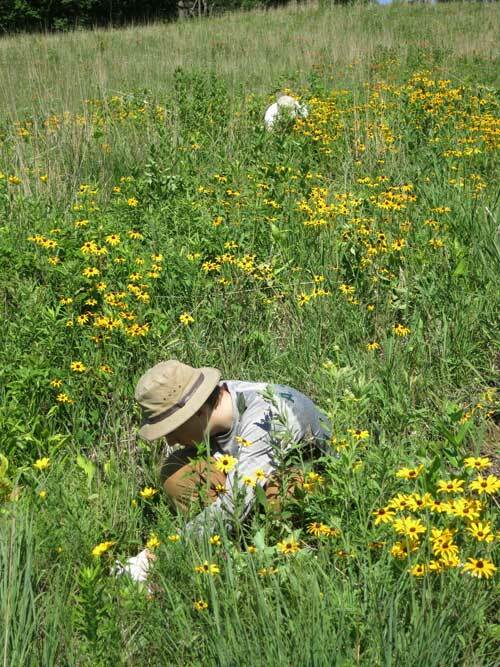 As the photo shows, this is "stoop" labor, but it is a delight to work in a prairie that is in such good shape. Five years ago we started to eradicate a large sumac clone in this area (which we call the Narrows). Today sumac is hard to find! in the background. This grass is most frequent on the Saddle. 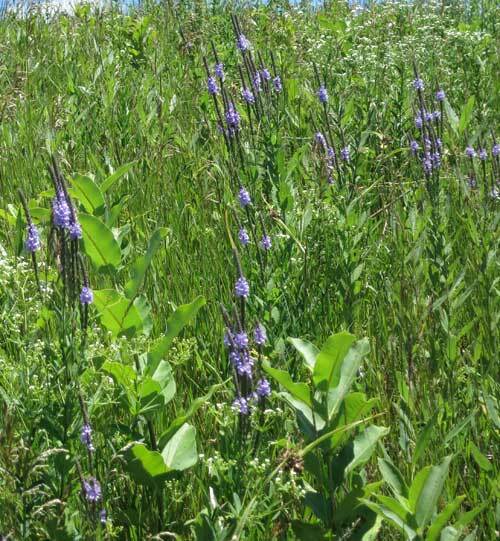 This post discusses a number of prairie plant species that "should" be at Black Earth Rettenmund Prairie but are not. 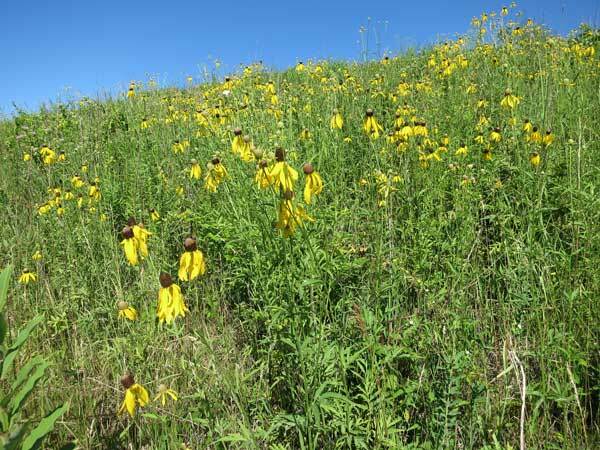 This discussion is based on a review of the various floras that have been done at Black Earth Rettenmund Prairie over the past 65 years, and on observations that Kathie and I have made during the past 15 years. See the table at the end of this post for a complete list of the prairie species known to be present. 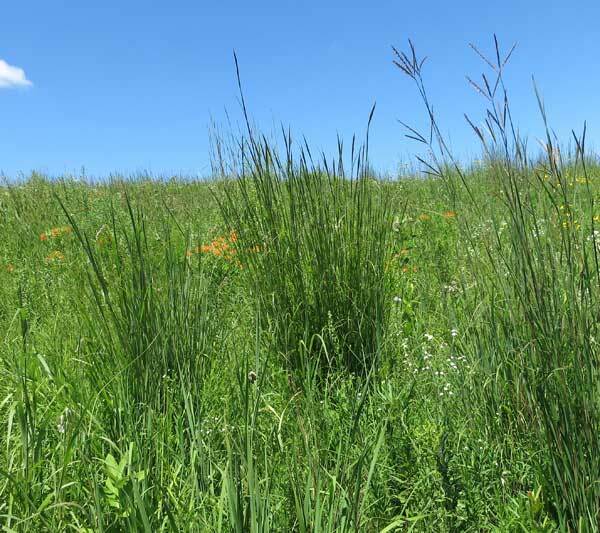 This outstanding Wisconsin prairie remnant is one of the jewels of southern Wisconsin, whose study goes back to the work in the early 1950s by John Curtis and students. Kathie and I have been managing this prairie since 2001, and I have done historical research on the site (Brock, 2014). This prairie is characterized by its diverse prairie flora and absence from disturbance. For the past 30 years it has been extensively managed, involving major and continuous brush and invasive tree control, weed control, and prescribed burns. Typical prairie grasses at Rettenmund are big bluestem, side oats grama, little bluestem, Indian grass, prairie dropseed, and needle grass. However, the present discussion is restricted to forbs, which are much more diverse. In their study of southern Wisconsin prairies, Curtis and Greene (1949) and Curtis (1959) classified prairie species, based on their natural distribution, into five categories: dry, dry-mesic, mesic, wet-mesic, and wet. Henderson (1998), using the Curtis data, followed these same categories. It should be noted that although most prairie species have an optimum habitat in one or two of the prairie types, most species are often found in the other prairie types, generally in reduced amounts. This is reflected in the Henderson data which give the percentage of prairie stands across the state in which a given species is found. Henderson’s data are derived from a computerized analysis of the Curtis data that was carried out by Umbanhowar (1992). (Computers were not available when Curtis did his analysis.) Fortunately, all of the Curtis original field data were still available to Umbanhowar. Rettenmund Prairie is a typical dry to dry-mesic prairie with a small amount of mesic habitat. It is mostly a high knoll that sits between crop fields, but lower areas along the northern edge, and the north-facing unit itself, are more mesic in character. Only a small area in one corner has ever been cropped, and cropping ceased about 30 years ago. The former crop field was planted to prairie about 10 years ago and now has a diverse species flora, with emphasis on species the grow well in dry-mesic to mesic sites. 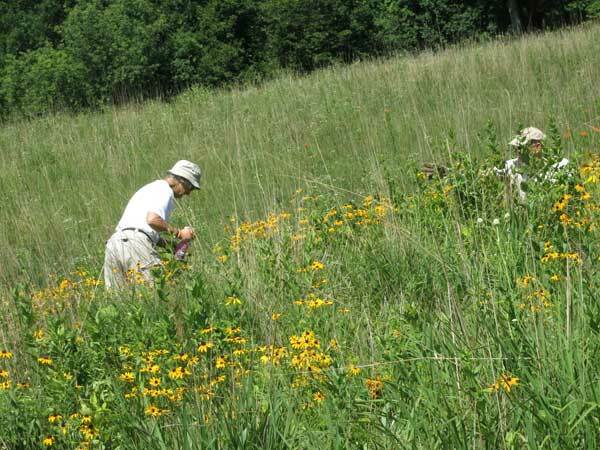 Although the prairie flora at Rettenmund is extensive and diverse, there are a number of species that are missing. The purpose of this post is to discuss these missing species. The complete Rettenmund Prairie species list is given at the end of this post, with their prairie types. The following table lists species that are missing but, based on their classifications, “should” be there. Each of these species is discussed separately below. Although Aster novae-angliae is primarily a mesic to wet-mesic species, it is also found in dry habitats, often on disturbed ground, railroad ballast, roadsides and ditches, etc. It is the showiest of the asters and hence is widely used in prairie plantings. Because it is showy, it is unlikely that it would be missed in any floristic survey. Astragalus Canadensis is common in southern Wisconsin and is found in borders, clearings, trails, roadsides, dry to mesic prairies, and other similar habitats. Baptisia alba is a widespread prairie species which, although primarily a mesic species, is often found on drier prairies. Although found only in southern Wisconsin, it is widespread here. Also, it is widely planted in prairie restorations, where it does extremely well. There are habitats at Rettenmund where this species could thrive, but it seems not to be here. Baptisia bracteata is also a widespread prairie species, found from dry to mesic prairies, dry lime sites, sandy and gravelly sites. A species of the prairies, it “should” be at Rettenmund, but isn’t. Although Ceanothus americanus is often considered a savanna species, it also thrives in dry to mesic prairies, roadsides, hillsides and banks, and other similar habitats. This relative of buckthorn is actually a shrub, but where prescribed fire is frequent it never gets very large. Extensive populations of Ceanothus are present a few miles from Rettenmund at Pleasant Valley Conservancy, including some thriving native populations along County Highway F. For some reason, seeds have been unable to manage the three mile distance along Highway F.
Echinacea pallida is present as a native in a few southern Wisconsin counties but is widely distributed in other states south of here, including a wide sweep of states along the Mississippi River. Also, it is widely used in prairie plantings where it grows extremely well. Native populations are known within 20 miles of Rettenmund, yet it has not worked its way here. Desmodium illinoiense and Desmodium canadense are prairie species that do well in dry-mesic to mesic habitats, and are widespread in Wisconsin. They both are found along roadsides and railroads. According to Cochrane and Iltis (2000) D. illinoense “…sometimes persist[s] along grassy, unshaded roadsides and railroads with mixtures of weeds and prairie or upland-thicket species.” D. canadense, being showy, is widely used in prairie restorations, where it thrives. Neither species has ever been reported from Rettenmund. Heliopsis helianthoides (false or ox-eye sunflower) is common throughout southern and western Wisconsin, on wet to dry-mesic prairies. Because it flowers early, it is also widely used in prairie plantings, where it thrives. Although Lespedeza capitata has never been reported at Rettenmund, it is widespread in Wisconsin and the Midwest. According to Cochrane and Iltis (2000) it is “Wisconsin’s most abundant native legume, common in dry to mesic prairies…”. According to Cochrane/Iltis, it is an active invader of roadsides, railroads, old field, and shores. It is easy to grow, is considered a bird attractant, and is often used in prairie seed mixes. Why isn’t it at Rettenmund? It has certainly become dispersed all over southern Wisconsin. Although two other species of Liatris are common at Rettenmund, Liatris pycnostachya is not present. This species is somewhat more mesic than the other two, and may require deeper soil for establishment. According to Cochrane and Iltis (2000), Parthenium integrifolium was once common in Wisconsin, primarily at mesic sites. Because most mesic sites have been converted to agriculture, this species is now found only on prairie remnants or on planted prairies. Since it thrives on planted prairies (including those at Pleasant Valley Conservancy) why hasn’t it become established at Rettenmund? Oxalis violacea is widespread in the Midwest and although primarily a mesic species, it is found frequently in southern Wisconsin and is especially present on prairies, including goat prairies, prairie glades, and other open habitats. It flowers early so that it is unlikely to be missed in any floristic study. Zizia aureus is another widespread prairie/savanna species, which although most frequently found in mesic habitats is also present in dry-mesic prairies. A single small patch of Zizia aureus was actually found at Rettenmund a few years ago, but did not return the following year. There are large amounts of Z. aureus along County F three miles from Rettenmund. The related species Z. aptera is also primarily a mesic species but does occur in dry-mesic sites. Although not now present at Rettenmund, it was reported by Read in 1972 and by Henderson in 1988. It should be emphasized that, based on the presence of existing species, suitable habitats exist at Rettenmund for all these missing species. Extensive mesic habitat is present on the north-facing hill of the north unit, where Phlox, Anemone canadense, Helianthus grosseserratus, and Heuchera richardsonii are currently thriving. Also, extensive areas of another mesic species, Thalictrum dasycarpum are present in the south unit. Why are these species missing? There have certainly been enough years for them to become dispersed. All of them flourish at nearby sites, even in many cases spreading “on their own”. Were they once here in the large presettlement prairie and when this prairie was fragmented, they were cut off and disappeared? Is the Rettenmund habitat unfavorable despite its suitability for other species, including many typical prairie species. Is the site too small? Are these species now dispersing to Rettenmund but are unable to compete with the already established flora? Brock, Thomas D. 2014. Legacy effects in prairie restoration: a 73-year spatial history. Proceedings of the North American Prairie Conference 23: 15-20. Umbanhowar, C.E. Jr. (1992). Reanalysis of the Wisconsin prairie continuum. American Midland Naturalist 127: 268-275. Curtis, J.T. and Greene, H.C. 1949. A study of relic Wisconsin prairies by the species-presence method. Ecology 30: 83-92. Curtis, J.T. 1959. The Vegetation of Wisconsin. University of Wisconsin Press, Madison, Wisconsin. Henderson, Richard. A. `998. Plant species composition of Wisconsin prairies. Technical Bulletin No. 188, Wisconsin Department of Natural Resources, Madiosn, Wisconsin. Cochrane, T.S. and Iltis, H.H. 2000. Atlas of Wisconsin Prairie and Savanna Flora Technical Bulletin No. 191, Wisconsin Department of Natural Resources, Madison.